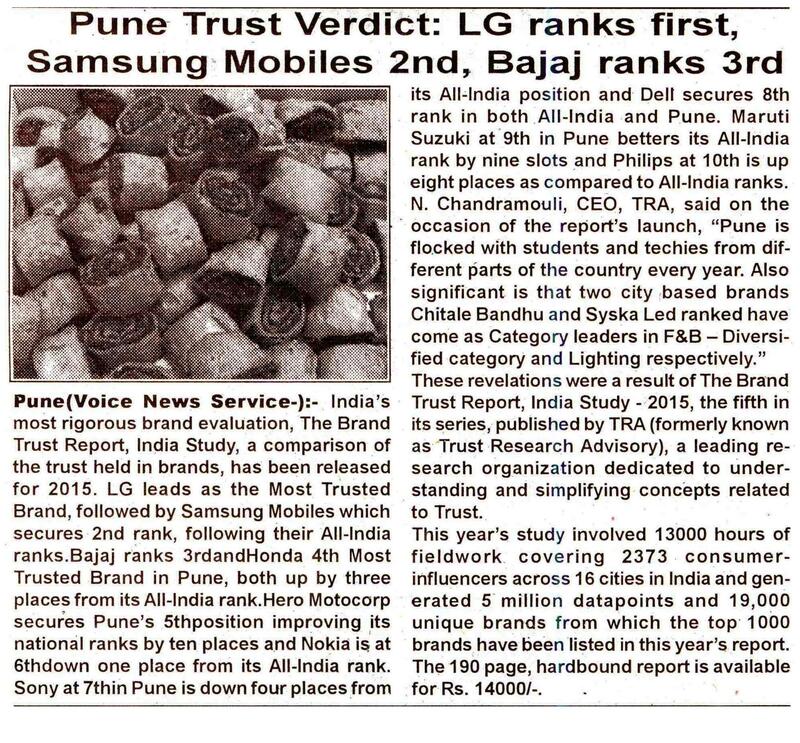 Ahmedabad, India, 3rdMarch 2015: India’s most rigorous brand evaluation, The Brand Trust Report, India Study, a comparison of the trust held in brands, has been released for 2015. AMUL, the pride of Gujarat, has been listed as India’s Most Trusted Food & Beverage (F&B) brand out of a total of 185 brands listed in the category. 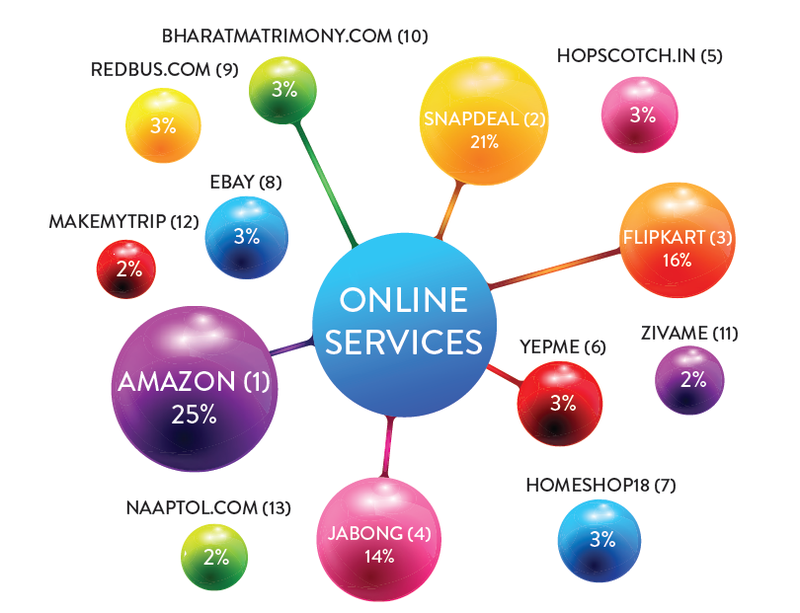 The brand climbed 67 ranks over last year and rose to become India’s 12th Most Trusted Brand this year leapfrogging several top F&B brands namely Pepsi, Coca-Cola, Britannia and Parle G. In the Category of ‘Dairy Products’ under F&B, Amul leads by a wide margin, and other brands that made it to the list are Mother dairy (All-India 230th rank) and Verka (All-India 365th rank). 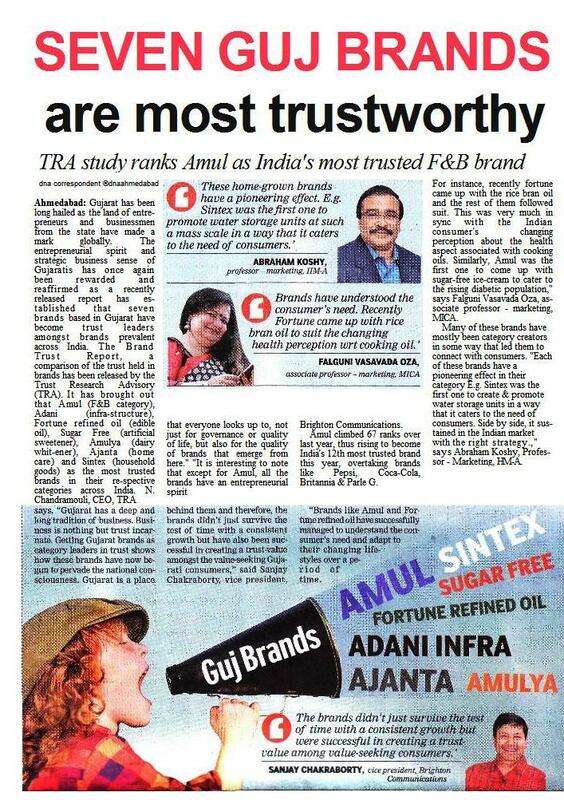 Fortune refined oil from Adani Wilmar displaced Saffola to become Most Trusted ‘Edible Oil’ brand this year. In that category, Sundrop takes 3rd rank, followed by Sunrise & Dhara. Yet another brand from the region, Sugar Free from Zydus Wellness, has been ranked as Most Trusted brand in the ‘Artificial Sweetener’ sub-category of the F&B list. Amulya from Amul is Most Trusted ‘Dairy Whitener’ brand in India and is followed by Anik Spray in its category. In the Home Care Category, Ajanta ranks as Most Trusted Brand trouncing Nilkamal and Godrej Locks. Sintex is the Most Trusted Brand in ‘Water Tank’ in India in Household Goods Category.In the Infrastructure Category, the leader is Gujarat based Adani ranked Most Trusted in the category this year, followed by 2nd and 3rd ranks by Hindustan Construction Company and Jaypee Group.